Bottled water is awful for our cities and ourselves. But without lightweight, well-designed alternatives for transporting tap water, no one is going to ditch the convenience of those terrible little tubes. I turned to our staff for some street-tested hydration solutions. Water portability comes with many personal preferences. While high-tech bells and whistles are sometimes a winning factor, often the simplest solution is best. Our contributors had a wide range of opinions on the best bottles, from cheap no-brand options to ones with fancy filters. Here are our picks. Our in-house expert for these things is Indefinitely Wild editor Wes, who says this: “Uncoated stainless steel bottles are best. They have no chance of leaching nasties into your drinking water, there’s no lining to melt or wear out and you can use them to boil water or even cook in an emergency. They’re also the easiest to clean. Wide mouths make them easy to use.” I’ve linked to a Klean Kanteen version of what he describes, but really, anything you find on a shelf in a gas station will work just fine. The Klean Kanteen brand is a favorite of many Giz staffers. The bottles are stainless steel with no lining so they have all the attributes that Wes describes. What’s nice is that these bottles use no plastic at all—even the lids (and there are many different kinds) are made from stainless steel, bamboo, and silicone. Kate says she uses one exclusively as her gym and travel bottle. I carry this one wherever I go (they come in a variety of colors, as you can see, which was important to me). For a certain type of water drinker, low price and simplicity win. 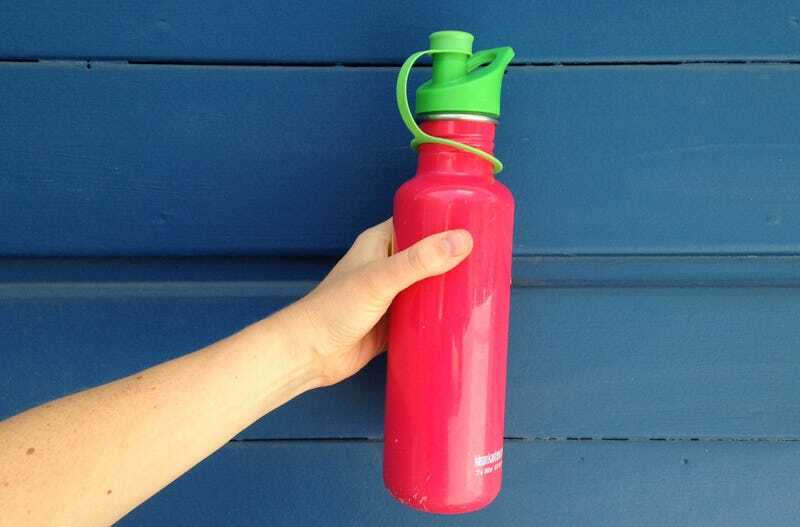 Nalgene’s no-fuss bottles fit the bill. “I use Nalgenes because they’re cheap and I lose things,” says Chris. Sometimes the best bottle is the one you don’t have to pay for at all. “I use one of these because I got it for free from Google, it washes nicely, and fits perfectly in the side pocket of my backpack,” says our EIC Annalee. “Only downside is that the wide mouth means that I can’t actually drink from it while walking because water sloshes out onto my face. I can’t be the only person with this problem, right? Maybe I’m just a drooling slob.” Maybe wide-mouth isn’t for everyone. In order to buy this exact bottle you’d have to order it in bulk (I assume with the Google logo?) but here’s a comparable shape and size by Pelican. Got a favorite we didn’t mention? Drop an image and link of your favorite reusable water bottle in the comments.